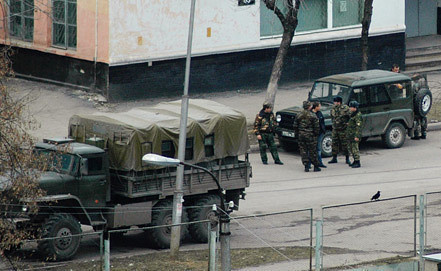 MAKHACHKALA, March 14 (Itar-Tass) – A police officer has been killed in Dagestan, and his machine gun has been stolen, the regional department of the Investigative Committee /SK/ told Itar-Tass. Criminal proceedings were opened over murder of police officer, illegal turnover of weapons and ammunition and theft of arms. On March 13, law-enforcers blocked militants in an abandoned shed in the outskirts of the village of Echeda, Tsumada district. They opened fire on police, fatally wounding one of them. The gunmen stole his machine gun and five magazines with 225 rounds of ammunition. The gunmen escaped. Law-enforcers found in the shed an assault rifle and a rucksack with a sleeping bag, food and medicines. The republic's operations headquarters earlier reported that the regime of antiterrorist operation was introduced in the area at 14:00, Moscow time, on Wednesday. The search for gunmen is continuing.